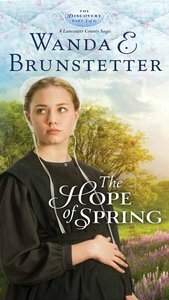 Book 3 of an exclusive 6-consecutive-month release Amish serial novel. New York Times Bestselling author, Wanda E. Brunstetter weaves a compelling love story brilliantly mingled with an unexpected twist. In part three of The Discovery--A Lancaster County Saga, Meredith Stoltzfus is trying to piece her life back together, while in a hospital miles away, a young man is fighting for his life and remains in a coma... .
About "The Hope of Spring (#03 in The Discovery Series)"